During this current period in the digital music age, when songwriters & music publishers are rightfully wondering if they will be paid fairly by streaming companies, we thought one of the best people to speak with is David Israelite. He is President & CEO of the National Music Publishers’ Association (NMPA). Israelite is one of the top music execs leading the way in the battle for music publishers & songwriters to be paid fairly from all revenue sources. This month, Israelite spoke on CNBC about the issues regarding music streaming, and he wrote an opinion piece in Wired magazine’s site, praising Taylor Swift for her recent removal of her songs from Spotify. He has a good overview of all the digital music and streaming issues, and what needs to be done for music publishers & songwriters to be paid fairly. Israelite has been the head of the NMPA since 2005. He is an attorney who served as Deputy Chief of Staff and Counselor to the Attorney General of the United States, where he served as the Attorney General’s personal advisor on all legal, strategic and public affairs issues. In March of 2004, the Attorney General appointed Israelite Chairman of the Department’s Task Force on Intellectual Property. The NMPA, which was founded in 1917, is the largest music publishing trade association which has over 3,000 members. Its mission is to protect, promote and advance the interests of music’s creators. The goal of the NMPA is to protect its members’ property rights on the legislative, litigation and regulatory fronts. Most of the major and independent music publishing companies are members of the NMPA. The Board Members of NMPA include such top execs as Martin Bandier (Chairman of Sony/ATV Music), Cameron Strang (Chairman of Warner/Chappell Music), Willard Ahdritz (CEO of Kobalt Music Group), Laurence Hubert (President of BMG Rights Management), Ralph Peer II (Chairman of peermusic), Matt Pincus (CEO of SONGS Music), Chip McLean (Senior Vice President of Disney Music Group), and Michael Sammis (Executive Vice President of Universal Music Publishing Group). 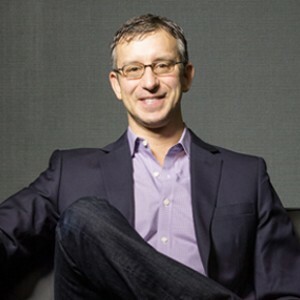 We are pleased to do this Q&A interview with David Israelite. He discusses the NMPA, the specific challenges music publishers & songwriters face, and what can be done to improve the current situation. DK: When did you join NMPA as President, and why did you decide to accept this position? Israelite: It was 2005—I was working at the Justice Department, chairing a task force on intellectual property. The NMPA was looking for a new CEO and it was a perfect fit for me. At the time, music piracy and theft of music was already a large challenge for the music industry. DK: Is it correct that the NMPA also runs the Harry Fox Agency (HFA)? Is part of your job to oversee Harry Fox? Israelite: Yes, NMPA owns the Harry Fox Agency, and I sit on the Board of HFA. However, HFA is operated separately from our NMPA office. HFA is based in New York City, and the NMPA headquarters is now based in Washington, DC. DK: Were you involved in the decision to move the NMPA to Washington, DC? Israelite: Yes, I recommended that the NMPA be based in Washington, DC. Since the NMPA is a trade association, I thought it would be more effective if we were based in Washington, DC. David Israelite with hit songwriters (front row l-r):Lee Thomas Miller, BC Jean, Kara DioGuardi, Linda Perry & Desmond Child. (Back row): Israelite. DK: How large a staff do you have in Washington, DC? Israelite: NMPA has a small staff of nine employees in our Washington, DC office. Other departments such as Human Resources and Accounting are handled out of a separate office. DK: You have a big job, trying to help music publishers & songwriters get paid fairly. Is it the streaming companies which pose the biggest problem? Israelite: If we look at the industry, in 2013 the music publishing & songwriting industry’s income consisted of about 50% from performance rights, 25% from mechanical royalties, and 25% from sync and lyric sources. The main question has become, how do you get compensated fairly for public performances? Our industry is moving from an ownership model to a world where consumers don’t want to own copies. They want access to music and to be able to stream. Performance income is currently about 50%, but this will continue to grow. We find ourselves restricted by the ASCAP Consent Decree (from 1941} and the BMI Consent Decree (from 1966). Under these Decrees, ASCAP and BMI must grant a license to anyone who requests it, even before a licensing fee is agreed upon. As a result, streaming companies such as Spotify and Pandora have been able to license and stream songs without paying a royalty rate which ASCAP and BMI (on behalf of music publishers & songwriters) considers fair. Currently, the rates which Spotify and Pandora have been willing to pay are much lower than what is fair to music publishers & songwriters. DK: What are the rates that Spotify and Pandora are currently paying to music publishers & songwriters? Israelite: Pandora pays only 4% of their income to music publishers & songwriters. Spotify pays only 10% of their income to publishers & songwriters. DK: What are ASCAP, BMI, music publishers & songwriters doing to try to resolve this problem? Israelite: We have asked the Department of Justice to review the Consent Decrees, and to modify the Decrees so that (1) ASCAP and BMI can accept partial Grant of Rights, which would allow music publishers to negotiate fair rates directly with the streaming companies, and (2) replace the current Rate-Setting Process with Expedited Arbitration, so that ASCAP and BMI could also negotiate for higher rates for music publishers & songwriters. The NMPA, ASCAP, BMI and over 200 other music companies and individuals have submitted their public comments to the Justice Department for their review of this issue. We hope that the Justice Department will respond with recommended changes to the Consent Decrees. DK: Is it true that other PROs, such as SESAC and Irving Azoff’s Global Music Rights, are not bound by these Consent Decrees? Israelite: Yes, SESAC and Global Music Rights are not restricted by the Consent Decrees. Irving Azoff recognized that performing rights income was not being valued in a fair market, so he has entered this space. SESAC and Global Music Rights play under different rules than ASCAP and BMI, who are restricted by the Consent Decrees. SESAC and Global Music Rights have never had a Consent Decree forced upon them. 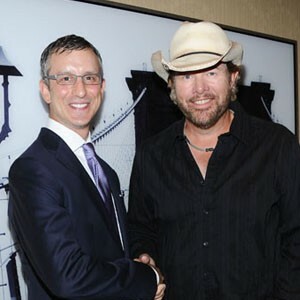 David Israelite with country star Toby Keith. DK: When will the Department of Justice announce their decision, on whether to modify the Consent Decrees? Israelite: We hope it will be early next year (2015) that the Justice Department responds and modifies the Consent Decrees. But we’ll have to wait and see—we have filed our public comments. Change comes hard—hopefully the Justice Department will understand how the music business has changed. DK: What can publishers and songwriters do, to lobby for this new legislation? Israelite: You can’t lobby the Justice Department. If you’re a music publisher, you need to be a member of NMPA. Join us and be part of a collective voice. There’s a chance this process will move over to Congress if the Justice Department does not modify the Consent Decrees in a satisfactory way. The best way is to stay involved—we’re all working on this together. DK: Taylor Swift recently pulled out of Spotify because she only wanted her songs heard by subscribers who pay a fee (instead of ad-supported free membership). Jason Aldean also took a stand, by pulling his songs from Spotify. Do you think this could become a trend, where publishers & songwriters push strongly for the paid method? Israelite: First, whether it’s a good or bad decision, songwriters & publishers need to make their own decision on whether to license their songs to the streaming services. Taylor Swift, as an artist, has the right to pull her songs from Spotify, but Taylor Swift, as a songwriter, doesn’t have the same right since she’s affiliated with BMI which is restricted by the Consent Decree. Second, I agree with Taylor that there is a benefit to push for the paid tier. There’s no legal right for Spotify to be able to play all songs for free. Taylor wanted to be on Spotify’s paid tier but not their free tier—Spotify said no to the choice. I also appreciate what Jason Aldean did, which is to take a stand and pull his songs from Spotify. I do see more artists doing what Taylor and Jason are doing. DK: Do the same issues which apply to Spotify, also apply to Pandora? Israelite: The difference between the two companies is Spotify is interactive (where listeners can select which songs to listen to) and Pandora is non-interactive (they hear a random selection of songs in a certain genre, similar to listening to a radio station). Labels can say no to Spotify but not to Pandora. Taylor Swift can’t pull music from Pandora. Pandora’s approach is even worse than Spotify. Songwriters & publishers receive only 4% of Pandora’s revenue, whereas they receive 10% of Spotify’s revenue. DK: I’ve heard that record labels and artists are getting a larger chunk of streaming royalties than songwriters & publishers—is this true? Israelite: Record labels have a different business model. It is true that labels are paid disproportionately more compared to what publishers & songwriters are being paid. Labels don’t have to deal with the issue of the Consent Decrees. DK: Is there any other comment you wanted to make, on the issues we’ve discussed? Israelite: I think it’s important that we understand…we feel the pain that songwriters and publishers are going through. No one is guaranteed success as a songwriter. But a successful writer deserves to be compensated fairly. We don’t guarantee a living for all songwriters, but a successful songwriter needs to be paid fairly and properly so they can make a living. Unfortunately, the market is currently not rewarding the songwriters who are having success. We don’t want a situation, where people choose to pursue another field and give up on music, because they can’t earn a living in music anymore.